Government: "The Spanish financial system is solid." Government calls troubled bank "not a very significant case"
MADRID, Spain (CNN) -- The Bank of Spain took over a troubled savings bank on Sunday, saying the bank has more than a 2 billion euro ($2.65 billion) shortfall that the government will guarantee, according to a government statement and CNN affiliate Cuatro TV. 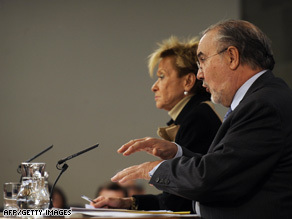 Spanish VP Maria Teresa Fernandez de la Vega and Deputy PM Pedro Solbes discuss the government's move. The takeover on Sunday is the first since the financial crisis hit Spain. Its Socialist government has previously lauded its banking sector for weathering the storm due to strict regulations and extra-cash provisioning measures. The chief executive officer and the entire board of the savings bank, Caja de Ahorros de Castilla-La Mancha, were relieved of duty and replaced on Sunday with three administrators appointed by the Bank of Spain, according to the statement and Cuatro TV. The savings bank, which operates in the sprawling Castilla-La Mancha region just south of Madrid, has assets of about 17.2 billion euros ($22.8 billion), but liabilities of about 19.5 billion euros ($25.8 billion), Cuatro reported. Second Deputy Prime Minister and Finance Minister Pedro Solbes told reporters he expected to use two to three billion euros for the ailing bank, Cuatro reported. But the prime minister's cabinet, which held an extraordinary Sunday meeting, approved a nine billion euro maximum credit for the entity if needed, the government statement said. The emergency measures emerged during the weekend after the bank's efforts to merge with a larger savings bank in the Andalusia region fell through. First Deputy Prime Minister Maria Teresa Fernandez de la Vega told reporters that savings deposits are guaranteed at the troubled bank. "The Caja de Ahorros de Castilla-La Mancha is a solvent entity," the government statement said, separately. "The Spanish financial system is solid. This is an isolated case." But the shadow finance minister, Cristobal Montoro, from the main opposition conservative Popular Party, told reporters the takeover was just the first of what would be future cases of troubled banks. Unlike private commercial banks, the savings banks in Spain are immersed in regional and local politics, with local governments often appointing a majority of the board members, as was the case with the Castilla-La Mancha savings bank. The bank has about a million clients and 500 branch offices, Spanish news reports said. The government statement said the troubled bank was "not a very significant case," given that "it represents less than one percent of the total assets of Spain's financial system." The Spanish government has been urging savings banks across the nation to consider alliances or mergers to better handle the financial crisis. Spain's unemployment rate of about 14 percent is the highest in the European Union. The financial crisis has hit Spain's once-booming construction industry particularly hard. New home starts, until recently an engine of the economy, plummeted 42 percent last year, the government reported last week.